This is a list of my favorite sewing supplies & tools. I’ve loved sewing ever since I was a little girl. (So, going on 50 years – gasp!) These are the sewing supplies & tools that I use for all of my sewing projects. Glass head straight pins – These pins are 1 7/8″ long and are very sturdy. I find them much easier to work with than smaller pins, especially when I’m trying to pin several layers of fabrics together. The glass head won’t melt if the pins get too close to the iron. Magnetic pin bowl – I have several of these bowls around around my sewing studio. They aren’t made for pins, but are actually used by auto mechanics to hold metal parts when they are working underneath a vehicle. Hand-sewing needles – I love John James Long Darners for hand-sewing. They are long and sturdy. Leather thimble – This leather thimble made by Clover is very comfortable to use while hand-sewing. I think it’s much more comfortable than using a metal thimble. Sew grip gloves – These gloves help you grip fabric, threads or strings. I find them very useful when I need to pull threads or strings when I’m gathering a sewing project. They only have one review on Amazon, and it’s not a very good one. They may not be good for some applications, but for what I use these gloves for, they work great. Thermal thimbles – I just recently started using these thermal thimbles. They’re very useful when you’re ironing a sewing project. They help protect your fingers from the heat and steam of the iron. I’m adding this picture of my 3 year-old grand daughter in my sewing studio. 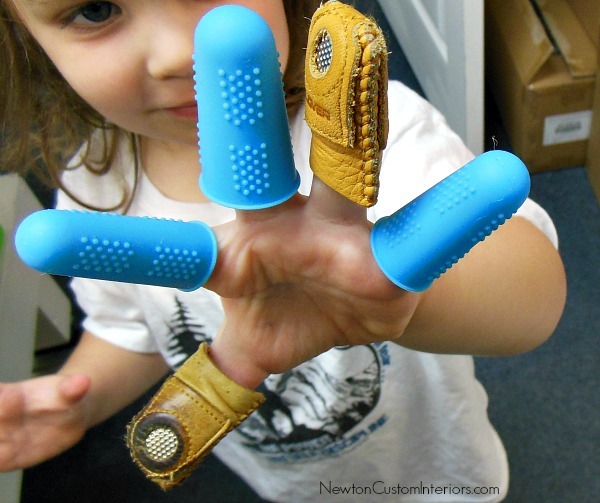 She loves the thermal thimbles (she uses them like finger puppets – not with the iron), but was upset there weren’t 5 of them. So, she added a couple of thimbles. Seam ripper – I really don’t like when I have to do some “reverse sewing”, but when I do need to take out some stitches it helps to have a good seam ripper. I have two different kinds – one made by Dritz and the other made by Clover. Both work well. I think I prefer the Dritz seam ripper because it’s a little bit larger than the Clover seam ripper. Both have the red ball to help protect against ripping the fabric. That Purple Thang – I’ve been showing this tool in several of my pillow videos. It’s great for turning out corners, and I use mine all the time when I’m making pillows. OmniGrip grid measuring tool – This measuring tool is very useful for quilters, but I also use it when I need to measure for cording or banding. It has markings for 1/8″ and 1/16″, and has useful angled markings. 18″ metal straight edge – I use this 18″ ruler to mark pleats for draperies and valances. 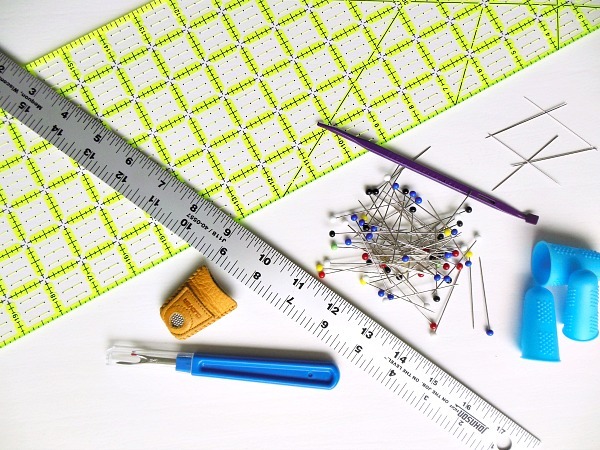 It’s useful for measuring lots of different types of sewing projects. I like that it has 1/8″‘ and 1/16″ markings. Fiskars Soft Touch Spring Action scissors – I use these scissors as my go-to everyday scissor. They have a spring action, so they are great if you have arthritis or carpel tunnel syndrome. Very comfortable to use all day. KAI 5210 Ergonomics 8″ dressmaking shears – I like these scissors because they aren’t too long, and also because they will easily cut through many layers of fabric. Gingher 4″ embroidery scissors – I have a pair of these next to each of my sewing machines. They’re great to cut my threads after I’m done sewing a seam, or if I just need a small pair of scissors for a small cutting job. Nippers by Golden Eagle – these are great for cutting lots of threads. They have a spring action like the Fiskars, so they make short work of cutting several threads. I use them when I’ve sewn my pleats into a panel, and have all of my threads to cut. KAI Rubber Stamping Shears – I use these scissors when I need to cut a large thickness, such as a large piece of cording. Reliable Velocity Iron – I recently needed to replace my iron, and this is the replacement that I bought. I’ve had good luck with the Reliable brand. Fairfield Soft Touch Pillow Forms – These are the polyester pillow forms that I love to use when I make pillows. They are a good quality pillow form. Singer Heavy Duty Sewing Machine – I recently bought this machine because my old home machine was just not cutting it anymore. It is heavier than a normal home sewing machine, which means if you sew fast the machine won’t be shaking all over the place! It also sews faster than a normal home sewing machine. 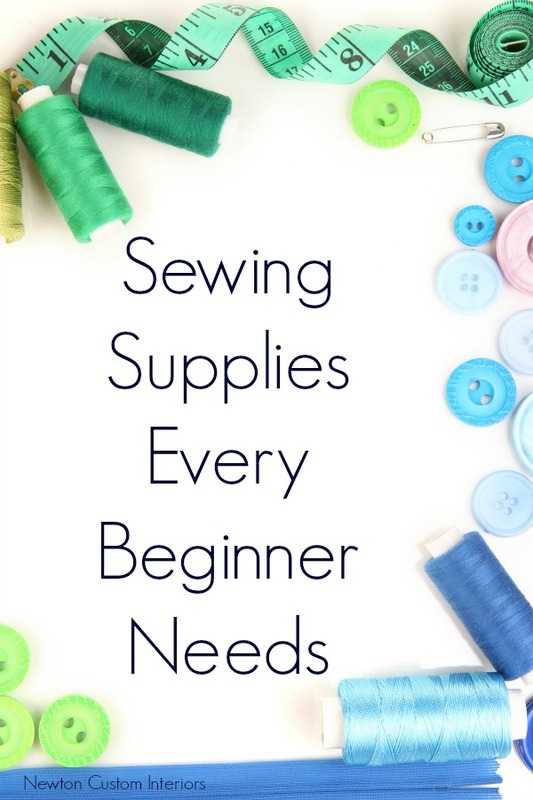 I hope you’ve enjoyed this list of my favorite sewing supplies and tools. What are some of your favorite sewing supplies and tools? You might also enjoy my Sewing Tutorials page, which has over 50 detailed sewing tutorials!